The CFC Online Orientation contains the information you’ll need to successfully complete your CFC grant application and have the best chance of receiving funding. Now that you’ve completed the CFC Online Orientation you can begin filling out a CFC Grant Application for your Registered Student Organization. 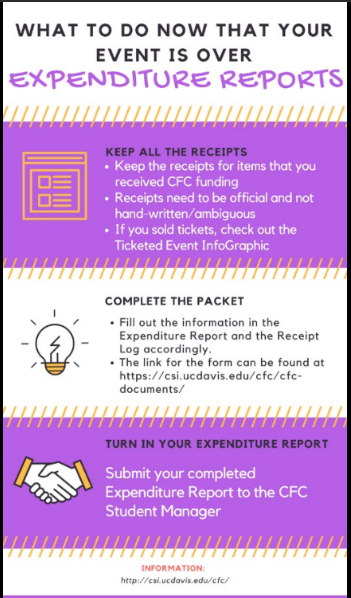 Complete the application on the Submittable link, with it you will need to upload your quotes and proof that you completed the CFC Online Orientation as well, and schedule a time to go to CFC Office Hours for intake! . Please make sure to have completed all of the items on this checklist before submitting your application. A CFC Board member will go over this checklist with you when you bring in your application. You must adhere to the following guidelines regarding any publicity materials created for your CFC funded event. Please submit your expenditure report within two weeks after the date of your event. You will need to upload receipts for the items that were funded by CFC and a copy of any publicity for the event. See the “Mandatory Statement of Credit for advertisements for Club Finance Council-funded programs and publications” page for more information. Additionally, if your event was travel-related, you must attach a roster of all UC Davis students that attended the event. 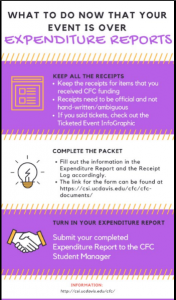 If your event was ticketed/you charged registration, you must download a copy of this Ticked/Registration Expenditure Report instead of the regular Expenditure Report listed above. You will need to attach receipts for all expenses and income (i.e. ticket sales, registration fees sponsorships, grants, etc.) You are strongly encouraged to meet with the CFC Student Manager if you are doing one of these reports to get help filling it out. Complete the following survey after you have turned in your Expenditure Report to help us improve the CFC process for the future and to tell us more about your experience. You must complete this survey after your event to complete the grant process. Student Organizations may apply for a loan from the CFC program. Make sure you save all documents to your desktop before working on them.